Best Blackberry Recipe Contest Winner! We have a winner! 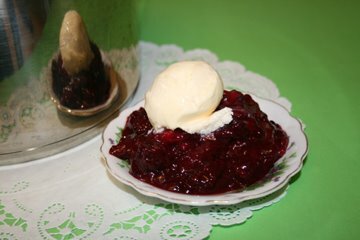 The winning contribution for the Best Blackberry Recipe came from writer Jean Ann Williams of Santa Maria, CA. Jean Ann’s recipe, On-Top-of-the-Stove Blackberry Cobbler, has been in her family for three generations and originated in Oregon, the birthplace of Blackberry Banquet. It’s one of those old-fashioned recipes that doesn’t require many ingredients or measuring because you suit it to your own taste. 1. As many blackberries you managed to pick. 2. Sugar to taste and added in before dough strips. 3. Favorite pie dough recipe made with shortening or lard, not butter. Prepare pie dough for either one or two crust pie, depending on how many berries. Wash berries in a colander, careful not to squeeze berries and therefore losing juices. Dump into a pot, not filling more than 2/3 full. DO NOT ADD WATER! Simmer on low to medium heat. Stir occasionally. Add the sugar to taste. Pull an apricot-sized ball of pie dough and roll thin on a cutting board. Cut long strips like for lattice weave about ¾ inches wide. Then, cut the lattice in half to accommodate layering into pot of berries. Once berries juices flow and thicken and boil slightly, add first layer of dough strips. Let simmer for five minutes to set the dough, and then stir into berries. Repeat the rolling of dough and continue this until all dough is gone or you have enough dough to suit you in cobbler. After last layer of dough is stirred in, let simmer for five more minutes. Take off stove and let cool to warm in the pot or in bowls. This cobbler is very tasty warm and with a side of ice cream. IF you have leftovers, refrigerate. Eating cold is another treat, but if you wish to reheat, then add a bit of water to stir into bottom of pan so as not to scorch. I make this for at least twelve servings and use the double pie dough recipe (with maybe a little leftover). We’ve never measured our ingredients, except for the dough and it always comes out tasty. Did I say never add water when making? That is a sure way to lose some of your rich berry flavors. Enjoy! Our family has for three generations. Also, I kept a lid on the pot while it simmered to retain the heat and “bake” the piecrust pieces. I served in custard cups with a choice of vanilla ice cream or whipped cream for my judging team. Thank you Terry and Jean Ann, for this delicious-sounding recipe. I can’t wait to try it! It’s just the way a fruit dessert should be, nice and simple so the fruit flavor comes through. Mmmm. Looks good. I can hardly wait to try it. I have been looking for this type of cobbler recipe for years–it's the kind I remember from childhood! Thank you so much.